Art Deco evolved during the 1920s and 1930s. Art Deco evolved during the 1920s and 1930s. The earlier style was geometric, but by the 30s the forms were streamlined, meaning that they were sleeker, more aerodynamic but, in fashion, also more form-fitting than the waist-less 20s. Both men's and women's fashion show the grace and elongation of this later development. These lovely people are as slim and self-contained as panthers. 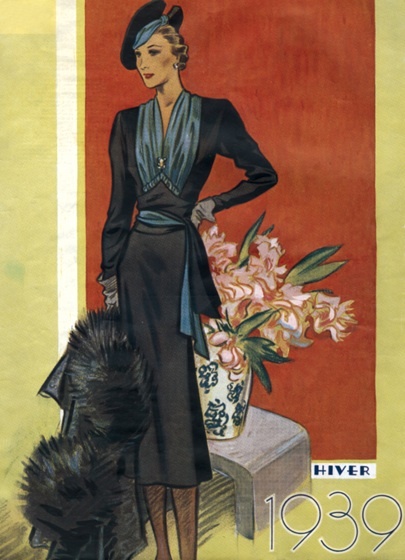 The world's economies may have been straitened in the 1930s, but Paris was still the center of haute couture, and women everywhere looked to Paris for inspiration and leadership in fashion. This image is a plate from the French periodical Grande Revue des Modes.